The Austrian Cuisine might be famous for Schnitzel and Schweinsbraten, but what will make you long to come back over and over again are the sweet dishes you can get in Austria. Today I want to start with 5 sweet dishes, which you can get as a main dish or as a dessert. Next week I will follow up with some famous Austrian “Mehlspeisen” (cakes and Strudels). The Austrian form of Crepes is a typical Austrian dish: its history goes back to the roman empire and it traces back to regions, which are now part of Romania, Hungary and Czech Republic. Most times Palatschinken are filled with jam or curd cheese, but there are also variants with Mushrooms or Spinach. The Palatschinke itself is also cut into small stripes to be used in a Fritatten-Suppe. If you ever see Omelette in Austria, you should be aware that this is a variant, where the pastry is thicker; an Omelette is also bigger and a lot of cooks make it a little crispy, by adding sparkling mineral water. Be aware that the german word for Ham is also Schinken, but this two things are not at all connected: a french friend once made the mistake to order Palatschinken as he did not speak german and thought that some Cooked Ham with Sauerkraut would be a great meal – he was rather surprised to get a sweet dish! Mohnnudeln are another traditional Austrian dish, that many people will eat as a main dish. Mohnnudeln are not real noodles, but rather like a form of Gnocchi as the noodles are made out of potatoes. Its rather easy to prepare: you prepare a dough out of potatoes, roll it thumb thick and cut the rolls in 5-10 cm long pieces. This are rolled again, so that they are spiky at the end a little thicker in the middle. Then you cook them like Gnocchi (once they swim, they are ready). 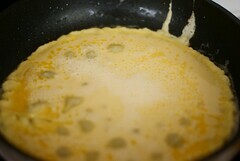 In a pan you melt butter, and put in some grated Mohn (Poppy Seed). You put the Noodles into the Pan and mix them with the Poppy Seed – afterwards you put some powdered sugar over them and serve them. It´s that easy, and its delicious! Austrias Cuisine is famous for its dumplings and there also exist some sweet variations: the most famous and probably most delicious are “Marillen-Knödel”: Marille is the Austrian word for apricot. The dough for the dumpling is a curd dough – the apricots are put into the dough and then dumplings are formed. Afterwards the dumplings are rolled in bread crumbs and then served with powdered sugar on top. There are local variations (with potatoe dough, or with Poppy Seed over them), but this is the most common recipe and you will find this dish in most places in Austria. Marillenknödel are a “must eat” if you visit the Wachau in Lower Austria or the Vinschgau in Southern Tyrol (Italy), as they have the best Marillen in the region. Germ Knödel are some kind of yeast dumpling filled with plum jam. You can eat them with vanilla sauce or with poppy seeds and melted butter. Germ Knödel are one of the favorite dishes when skiing or hiking in the Alps, as almost every hut offers them. In my oppinion the poppy-seed/ butter option is the way to go, but people might be a little bit frightened of the big amount of butter, that goes with it. If you ever hike in Austria or have a day skiing in one of the many great ski resorts, give them a try! 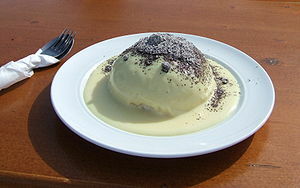 This is probably Austrias most famous sweet dish. There is a very renown story about its invention: The cook of Emperor Franz Josef (1830 – 1916) prepared some Palatschinken, but for some reason he cut the dough into small pieces and put some powdered sugar over it. He then served it with some plum (Zwetschkenröster). 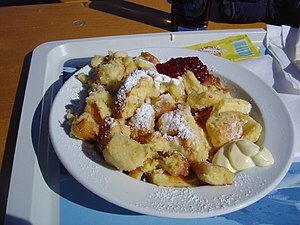 When the Emperor saw this dish, he remarked “What kind of Schmarren (silly thing) are you serving me today” … the name stuck and so this dish is now called Kaiserschmarren (The emperors silly thing). Its not historically confirmed, that this happened this way, but one thing can be confirmed: if you visit Austria you need to try some Kaiserschmarren! You can have it as a sweet dish, but a lot of times you will get a huge helping, so you might want to consider to have one as a main dish, or share it with your friends! I hope you enjoyed this weeks “Austrian Cuisine” Edition. I am looking forward to your feedback and will provide you with some more sweet dishes next week!